– former Clinton advisor Larry Summers. It is not the intent here to get into specific details about the Middle East which is of utmost importance to several players in the region. The chessboard is open for the players and there will be one winner. The idea behind this article is to provide a brief about the current situation among various strategic alliances and relations and the possible outcome over time. Readers can form their own opinions based upon their own understandings. “Saudi Arabia has enormous responsibilities within the region, as the cradle of Islam and one of the Arab world’s most significant political powers” wrote Mohammed bin Nayaf bin Abdul Aziz al-Saud, in the opinion section of the New York Times of 17 December 2013 titled “Saudi Arabia Will Go At It Alone”. The NYT article is worth reading as it exposes the Saudi designs in the region and one that would result in the destabilization of the region. Bin Nayaf is the Saudi Minister of Interior and a contender to the Saudi throne. He continues on in the OpEd that “We believe that many of the West’s policies on both Iran and Syria risk the stability and security of the Middle East. This is a dangerous gamble, about which we cannot remain silent, and will not stand idly by.” Six months later, ISIS emerges from out of nowhere to create a carnage and fear among the various tribes in Northern Iraq and beheadings of western workers in the region. To get some understanding about the origins and objectives of ISIS, watch the “Syrian Girl” (Mimi al-Laham) video presented by Alex Jones. In February 2014 Bin Nayyaf was made responsible for Syria replacing Bandar bin Sultan. The messages that both Mohammed bin Nayyaf and Bandar bin Sultan have been playing out is that Saudi Arabia now considers itself as a key player within the region predominantly because it is vying for a political position in direct competition with Iran, less out of fear as a Shia regional power but more out of a fear of loss of economic addictions of the royal families coming from oil revenues and economic gains emanating from Islamic pilgrimages. In pre-Islamic Arabia, a few powerful Arabian families reaped political and economic power from hold on trade (synonymous to oil) and pilgrimages, much as what is the current practises of the royal families . The advent of Islam exposed the rampant corruption of those families and instituted social changes that benefitted all Arabians and most particularly women. The few powerful royal Saudi families now fear the same social changes. Saudi is a repressive regime and the US may have to deal with that at some point in time. Saudi Arabia is not in the position of going at it alone to secure their political position in the Middle East. It has therefore, along with Qatar, extensively funded ISIS to bring about regime change in Syria, a key ally of Iran, Iraq and Hezbollah in Lebanon. The US, it’s western partners (including Turkey) are accruing economic gains in the form of arms sales and the toppling of the Assad regime, if successful. The US, Turkey, Europe, Britain and the Sunni Arabs hope to gain in the reshaping of the region as did the Arabs after the collapse of the Ottoman empire. For Saudi Arabia, Qatar and UAE it is more Wahhabist dominance they’re seeking after the Shias are pacified. The runner-up prizes are more land and oil. The on-going “war on terror” game of fear benefits the west. 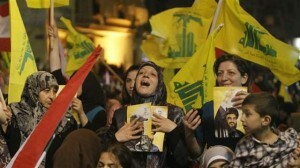 A Hezbollah supporter holds pictures of Lebanon’s Hezbollah leader Sayyed Hassan Nasrallah. Over the past 35 years, Iran has been aggressed by the Arabs starting with the 1980 war by Saddam which was financed by Saudi Arabia and Kuwait and supported by the western powers. They failed. Under no circumstances and at no time has Iran been in the role of an aggressor. Iran has accordingly been taking measures to protect itself from further aggression. It has not, unlike Saudi Arabia or Afghanistan, participated or financed the war on terror against the west or any other nation. Iraq’s modern borders were demarcated in 1920 following the fall of the Ottoman Empire and a Sunni monarchy was installed by the British. When the US invaded Iraq in 2003, it had no choice but to accept a parliamentary Shia dominated democratic government due to the break-up of the Baath party. The Shias, moreover, make up 62% of Iraq’s population. It is therefore natural that Iraqi Shias would equate politically and religiously with Iran just as Saudis would with Qatar and Abu Dhabi. Bahrain, Kuwait or Yemen has abstained from joining the current coalition because of their significant Shia populations. Among all the Middle East countries, Iran has the best understanding of regional issues and has exhibited maturity in attempting to deal peacefully with those issues. Iran continues to support Iraq against ISIS offensive as it has in the past successfully provided support to Hezbollah in July 2006 when Israel had launced an offensive against Lebanon. In the most recent aggression against Syria, Iran has provided support for the past 3 years. The inverted Shia crescent extending from Iran to Lebanon via Iraq and Syria is strategically vital for Iran’s survival. Both Iraq and Syria are Iran’s conduit to Lebanon. Under the Eastern Ukrainian pretext, NATO has been putting economic pressure on Russia so that it would withdraw it’s support for Syria. Putin is a master strategist and unlikely to succumb. Due to the Russian and Chinese UN vetoes, Syria has survived the aggression for three years. For the third time on 19 July 2012 Russia and China vetoed resolutions on Syria since the uprising began against President Bashar al-Assad. The Russian ambassador, Vitaly Churkin, told the Security Council in explaining the Russian veto that what they (west) really want is Mr. Assad’s downfall because that would severely weaken the influence of Iran, Syria’s only ally in the region. Russia has strong economic and military ties with both Iran and Syria. On the other hand, China has become wary about western plans to reshape the region and install governments in Iran and Arab countries that would be economically and militarily favorable to the west. 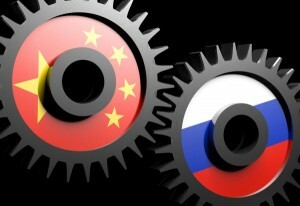 China, Russia and Iran feel that such moves by western powers would eventually lead to aggression against them. 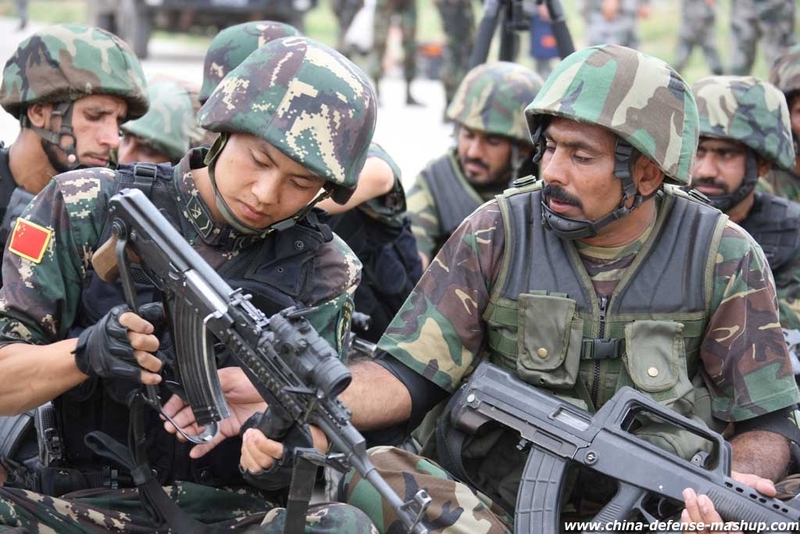 « Joint Peace Angel 2014 » China-Pakistan exercise was held in April 2014 over two weeks near Rawalpindi, in the north of Pakistan. Pakistan is expected to be a key regional player. It has very close ties with China. Pakistan is of considerable strategic importance to China. It is a confluence between China, Afghanistan and Tajikistan at its northernmost border from where the 1300 km Karakoram highway passes, built from Kashghar in Xinjiang province of China to Abbottabad, Pakistan. The Karakoram highway and the 1250 km Indus highway in Pakistan provides a direct land route for China to Karachi and the Gwadar port. Pakistan’s military which controls the foreign policies has been nudging towards closer relations with China since it has become wary of US intentions in the past. Pakistan abstained from voting on the Syria UN resolution in July, 2012. The Gwadar Port on the Indian Ocean in Pakistan which is only 125 km west of the Iranian border is also of strategic importance to China. In 2012 China confirmed that it would be taking control of Gwadar, which they believe has the potential to serve as an oil pipeline hub for Chinese energy needs. Besides the oil hub Gwadar can serve as a direct land route for China to the warm waters, as a gate to Strait of Hormuz, trade link to the landlocked Central Asian SCO regions, a full-fledged regional hub, quite possibly a naval base and a trans-shipment port in the future. It remains to be seen in the future whether the NATO-Arab (excluding Syria and Lebanon) alliance will be successful in their efforts to reshape and dominate the Middle East. If it is successful in bringing about the regime change in Syria and then Lebanon (an undertaking by Israel), it is possible that the next move on the chessboard would be aggression against Iran and Pakistan. If that is the scenario that would be played out, China and Russia will become directly involved in the region resulting in a catastrophic war. On the flip side, failure of the NATO-Arab alliance in Syria’s regime change will result in a more peaceful region with little or no external superpower interference and Iran providing regional but peaceful environment. The Arab allies of the western powers would be the eventual losers since the US-NATO alliance would have to abandon the region due to policy failures. It is too early and difficult to predict the outcome. This writer sees an eventual regional outcome within the next 2 years.